New research from powder characterisation specialist Freeman Technology uses the company's FT4 Powder Rheometer to explore the application of dynamic powder testing in assessing the impact of humidity on powder flow. Members of the Freeman Technology team will be available on the company's stand at Powtech 2011 (11-13 October, Nürnberg, Germany) to discuss their findings and to demonstrate the FT4 Powder Rheometer. 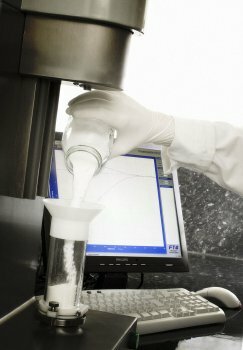 The FT4 Powder Rheometer measures a wide range of bulk and dynamic powder properties. This research will be of particular interest to manufacturers working to improve their ability to control and more effectively manage this aspect of powder processing. The new data indicate that moisture adsorbed from the environment can have a range of effects, depending on the powder type, whether hydrophobic or hydrophilic, and the results challenge the simplistic conclusion that all adsorbed moisture is detrimental to powder flow. Furthermore the work shows that under conditions of either low or extremely high humidity the impact of moisture on powder flow properties is not linear. The conclusion is that no single powder property precisely captures the effects of humidity but that measurement and analysis of a combination of bulk and dynamic powder properties does provide a degree of insight. To find out more about these humidity studies, to learn more about dynamic powder characterisation, or to see the FT4 Powder Rheometer in action, visit the Freeman Technology stand at Powtech Hall 6-444.